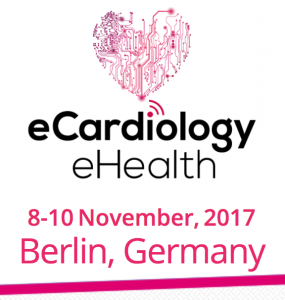 Review of the 4th European Congress on eCardiology and eHealth that took place in Berlin, 8-10 November 2017. Apps and devices. The number of cardiac apps and devices has grown exponentially in the last years. The devices are becoming more miniaturized and multifunctional. However, eHealth apps and devices used in the acute and chronic care need to be tested and validated more rigorously, for these tools to be used with confidence by the patients and cardiologists. The way that we interact with our patients either in the ICU (intensive care unit) either on the long run becomes more and more digital. Trends in acute and chronic care represent the use of smaller devices that continuously monitor parameters non-invasively (miniaturized echocardiographs that connect to smartphones; wireless ECG, heart rate and temperature surveillance; smart clothes that incorporate sensors) or invasively (fluid congestion monitoring devices such as the microelectromechanical system (MEMS) pressure sensor(1), continuous glucose and lactate monitoring). As advanced patient telemonitoring in the acute and chronic care has started and is evolving with big steps, we have more and more evidence of its efficacy (similar medical outcomes vs. standard care and lower cost). For more on this subject please visit the congress website (http://www.e-cardiohealth.com/interviews-2017) and/or the ESC eCardiology LinkedIn group (https://www.linkedin.com/groups/8631024/profile). Telemedicine has been proven to work. Telecare is on its ascending trend and this is only the beginning. Several important studies were presented and they all showed that telemedicine has similar result compared to standard care and is also cost-effective (1, 2, 3). Topics on security and privacy. The legal framework for the use of telemedical care in Europe is very important mainly because cardiologists become very vulnerable when trying to treat patients by telemedicine, due to regulatory flaws in the EU legislation. However, the European Commission is expected to publish new regulations in 2018. To be noted that before deploying a telemedicine project or being involved in one, the cardiologist should check the applicable rules and legislation, should check the obligations for each actor (who is responsible for what), should make contractual arrangements, and should check the insurance policy (telemedicine must be included). Other hot topics referred to: security and privacy issues (for the patient to be more and more confortable with telecare, ownership of collected personal data has to be clearly specified, irrespective of acute or chronic patients) and reimbursement issues (identify which type of financial schemes should be used for the reimbursement of telemedicine). 1. Abraham WT, Stevenson LW, Bourge RC, Lindenfeld JA, Bauman JG, Adamson PB; CHAMPION Trial Study Group. Sustained efficacy of pulmonary artery pressure to guide adjustment of chronic heart failure therapy: complete follow-up results from the CHAMPION randomised trial. Lancet. 2016 Jan 30;387(10017):453-61. doi: 10.1016/S0140-6736(15)00723-0. Epub 2015 Nov 9. PubMed PMID: 26560249. 2. Kraal JJ, Peek N, van den Akker-Van Marle ME, Kemps HM. Effects and costs of home-based training with telemonitoring guidance in low to moderate risk patients entering cardiac rehabilitation: The FIT@Home study. BMC Cardiovasc Disord. 2013 Oct 8;13:82. doi: 10.1186/1471-2261-13-82. PubMed PMID: 24103384; PubMed Central PMCID: PMC3851796. 3. Frederix I, Solmi F, Piepoli MF, Dendale P. Cardiac telerehabilitation: A novel cost-efficient care delivery strategy that can induce long-term health benefits. Eur J Prev Cardiol. 2017 Nov;24(16):1708-1717. doi: 10.1177/2047487317732274. Epub 2017 Sep 19. PubMed PMID: 28925749. 4. Frederix I, Vandijck D, Hens N, De Sutter J, Dendale P. Economic and social impact of increased cardiac rehabilitation uptake and cardiac telerehabilitation in Belgium – a cost-benefit analysis. Acta Cardiol. 2017 Aug 11:1-8. doi: 10.1080/00015385.2017.1361892. [Epub ahead of print] PubMed PMID: 28799460.